Thus, at a rate of 10 Gbps, for MTU-size packets, we require to sustain a rate of processing approximately 1 packet per microsecond! (and that’s half-duplex, effectively cutting the time down to half for full-duplex)! Well, it’s not- not over sustained periods. For one, the interrupt load would be far too high for the processor to effectively handle (leading to https://en.wikipedia.org/wiki/Source_lines_of_codewhat’s called “receive livelock”). 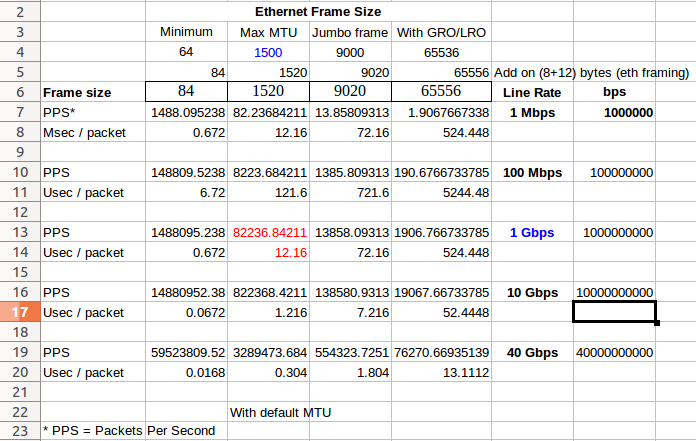 For another, the IP (and above) protocol stack processing would also be hard put to sustain these rates. Modern hardware NICs and operating systems use high performance offloading techniques (TSO / LRO / GRO). These essentially offload work from the host processor to the hardware NIC, and effectively allow large packet sizes as well. TSO effectively lets us offload 64KB of data (to the hardware NIC for segmentation and processing). If the host did the usual TCP processing at typical MSS sizes, this works out to approximately (MTU-40)-sized segments ~= 1460 bytes. Thus, with TSO, we get an ~ > 40X saving (65536/1460 = 44.88) on CPU utilization! 100 Gbps ~ 48 ns ~ 20,833,333 (nearly 21M pps) ! thus, more than 2 cache misses will wipe out the available time budget! “The (Linux) kernel, today, can only forward something between 1M (M=million) and 2M packets per core every second, while some of the bypass alternatives approach a rate of 15M packets per core per second.” Source: “Improving Linux networking performance”, Jon Corbet, Jan 2015. First, please view this brilliant infographic from the “informationisbeautiful” book (and website). And, here’s the same numbers in a Google sheet! “The avionics system in the F-22 Raptor, the current U.S. Air Force frontline jet fighter, consists of about 1.7 million lines of software code. The F-35 Joint Strike Fighter, scheduled to become operational in 2010, will require about 5.7 million lines of code to operate its onboard systems. And Boeing’s new 787 Dreamliner, scheduled to be delivered to customers in 2010, requires about 6.5 million lines of software code to operate its avionics and onboard support systems. “Car Software: 100M Lines of Code and Counting” – Article on LinkedIn. David A. Wheeler studied the Red Hat distribution of the Linux operating system, and reported that Red Hat Linux version 7.1 (released April 2001) contained over 30 million physical SLOC. He also extrapolated that, had it been developed by conventional proprietary means, it would have required about 8,000 man-years of development effort and would have cost over $1 billion (in year 2000 U.S. dollars). A similar study was later made of Debian GNU/Linux version 2.2 (also known as “Potato”); this operating system was originally released in August 2000. This study found that Debian GNU/Linux 2.2 included over 55 million SLOC, and if developed in a conventional proprietary way would have required 14,005 man-years and cost $1.9 billion USD to develop. Later runs of the tools used report that the following release of Debian had 104 million SLOC, and as of year 2005, the newest release is going to include over 213 million SLOC. Often, especially for nerdy programmers, it’s a good idea to be familiar with powers of 2. I won’t bore you with the “usual” ones (do it yourself IOW 🙂 ). How large is the entire VAS? It’s 2^64 of course, which is 18,446,744,073,709,551,616 bytes ! Wow. What the heck’s that, you ask?? (see the Summary Table below too). The binary approximation of the kilo-, or 1,000 multiplier, which causes a change of prefix. For example: 1,024 bytes = 1 kilobyte (or kibibyte). This number has no special significance to computers, but is important to humans because we make use of powers of ten. The hardware page size of Intel x86 processor. The number of distinct values representable in a single word on a 16-bit processor, such as the original x86 processors. The maximum range of a short integer variable in the C#, and Java programming languages. The maximum range of a Word or Smallint variable in the Pascal programming language. The binary approximation of the mega-, or 1,000,000 multiplier, which causes a change of prefix. For example: 1,048,576 bytes = 1 megabyte (or mibibyte). The number of unique colors that can be displayed in truecolor, which is used by common computer monitors. This number is the result of using the three-channel RGB system, with 8 bits for each channel, or 24 bits in total. The binary approximation of the giga-, or 1,000,000,000 multiplier, which causes a change of prefix. For example, 1,073,741,824 bytes = 1 gigabyte (or gibibyte). The number of non-negative values for a signed 32-bit integer. Since Unix time is measured in seconds since January 1, 1970, it will run out at 2,147,483,647 seconds or 03:14:07 UTC on Tuesday, 19 January 2038 on 32-bit computers running Unix, a problem known as the year 2038 problem. The number of distinct values representable in a single word on a 32-bit processor. Or, the number of values representable in a doubleword on a 16-bit processor, such as the original x86 processors. The range of an int variable in the Java and C# programming languages. The range of a Cardinal or Integer variable in the Pascal programming language. The minimum range of a long integer variable in the C and C++ programming languages. The total number of IP addresses under IPv4. Although this is a seemingly large number, IPv4 address exhaustion is imminent. The binary approximation of the tera-, or 1,000,000,000,000 multiplier, which causes a change of prefix. For example, 1,099,511,627,776 bytes = 1 terabyte (or tebibyte). The binary approximation of the peta-, or 1,000,000,000,000,000 multiplier. 1,125,899,906,842,624 bytes = 1 petabyte (or pebibyte). The binary approximation of the exa-, or 1,000,000,000,000,000,000 multiplier. 1,152,921,504,606,846,976 bytes = 1 exabyte (or exbibyte). The number of distinct values representable in a single word on a 64-bit processor. Or, the number of values representable in a doubleword on a 32-bit processor. Or, the number of values representable in a quadword on a 16-bit processor, such as the original x86 processors. The range of a long variable in the Java and C# programming languages. The range of a Int64 or QWord variable in the Pascal programming language. The total number of IPv6 addresses generally given to a single LAN or subnet. One more than the number of grains of rice on a chessboard, according to the old story, where the first square contains one grain of rice and each succeeding square twice as many as the previous square. For this reason the number 264 – 1 is known as the “chess number”. The binary approximation of yotta-, or 1,000,000,000,000,000,000,000 multiplier, which causes a change of prefix. For example, 1,180,591,620,717,411,303,424 bytes = 1 Yottabyte (or yobibyte). 286 is conjectured to be the largest power of two not containing a zero. The total number of IPv6 addresses generally given to a local Internet registry. In CIDR notation, ISPs are given a /32, which means that 128-32=96 bits are available for addresses (as opposed to network designation). Thus, 296 addresses. The total number of IP addresses available under IPv6. Also the number of distinct universally unique identifiers (UUIDs). The smallest power of 2 which is greater than a googol (10100). The maximum number that can fit in an IEEE double-precision floating-point format, and hence the maximum number that can be represented by many programs, for example Microsoft Excel. One more than the largest known prime number as of 2013. It has more than 17 million digits. Library data: The U.S. Library of Congress Web Capture team claims that as of March 2014 “the Library has collected about 525 terabytes of web archive data” and that it adds about 5 terabytes per month. Computer hardware: Hitachi introduced the world’s first one terabyte hard disk drive in 2007. Social networks: As of May 2009, Yahoo! Groups had “40 terabytes of data to index”. Encyclopedia: In January 2010, the database of Wikipedia consists of a 5.87 terabyte SQL dataset. Climate science: In 2010, the German Climate Computing Centre (DKRZ) was generating 10000 TB of data per year, from a supercomputer with a 20 TB memory and 7000 TB disk space.